Welcome to the Home of TrabantUSA!! So you aren't sure what a Trabant is? ....Oh my! 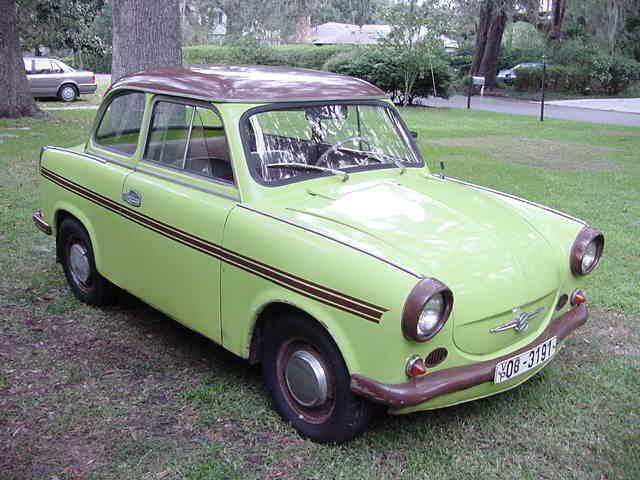 In a nutshell, the Trabant is a tiny, 2 cylinder, 2-cycle engined automobile built of "Duraplast" ( a cotton-epoxy, eastern european version of fiberglass.) These cars were the standard motor vehicle in communist East Germany (The DDR) and prior to 1990 they clogged the streets of many eastern european cites. Once everywhere in the East, 19 years after the fall of the Berlin Wall and demise of Communism they are fast disappearing! Don't get me wrong...there are still a lot of them around (according to 2007 German Statistics; 52,000 are still registered) but the majority (over 900,000) have been destroyed in the last 19 years. I am not sure how many of them are actually in the USA as the US Customs Service would not release that information to me upon request but the number is LOW! An estimate by one importer is approximately 200-250. This entire web-site is in fact my attempt to create a gathering point for other Trabant owners to exchange information about our rare treasures! What can we accomplish online? I hope to build-up a network of Trabant owners & fans in the USA so that we can not only exchange pictures & stories but also technical knowledge, advice, parts and Trabi contacts throughout the world. We Trabi drivers are a rare breed here in North America and we need to communicate if we hope to preserve our Trabants. The Trabant is after all a motor vehicle of amazing historical importance, political symbolism & technological achievement unlike any other collectors car. Add to this its EXTREME rarity in this country and you are talking about a TRUE collectors item! Let's keep'em on the road and lookin sharp! Sign our Guestbook! View Guestbook! If you wish to become a member, send me a short story about your Trabbi with a few photos, and I will add you promptly.